Remember the old song by Queen, "Another one bites the dust"...? Well, that's what we're experiencing with vehicles. They keep biting the dust. Younger Daughter's Hundai Santa Fe died in late December. We donated it to the Union Gospel Mission Motors in Spokane Valley. We're huge fans of the Union Gospel Mission (read this to understand why), and try to support them whenever possible. Anyway, that meant we were down to one vehicle, our Dodge Durango. It's been giving us some trouble, but after pouring $1200 into it in early January, we were confident it would last a while. On that day, I was driving back from Coeur d'Alene after a day of errands. About halfway home, I suddenly heard BANG clunk clunk clunk clunk clunk etc. 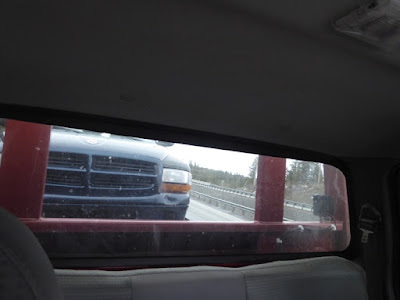 This happened on a bridge, so I slowed down, limped off the bridge, and parked on the side of the highway. 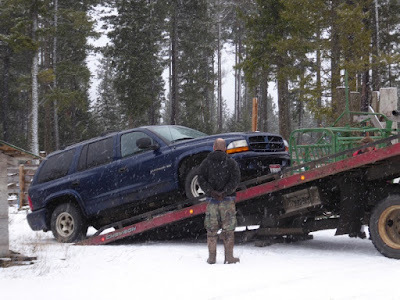 An hour later, the tow truck driver arrived and loaded the sad heap of the Durango onto his flatbed. He peered underneath the vehicle. "The transfer case cracked in half," he remarked. "I'll bet that made a helluva loud noise." Yep, it did. With the Durango on the flatbed, the driver headed down the highway toward home. 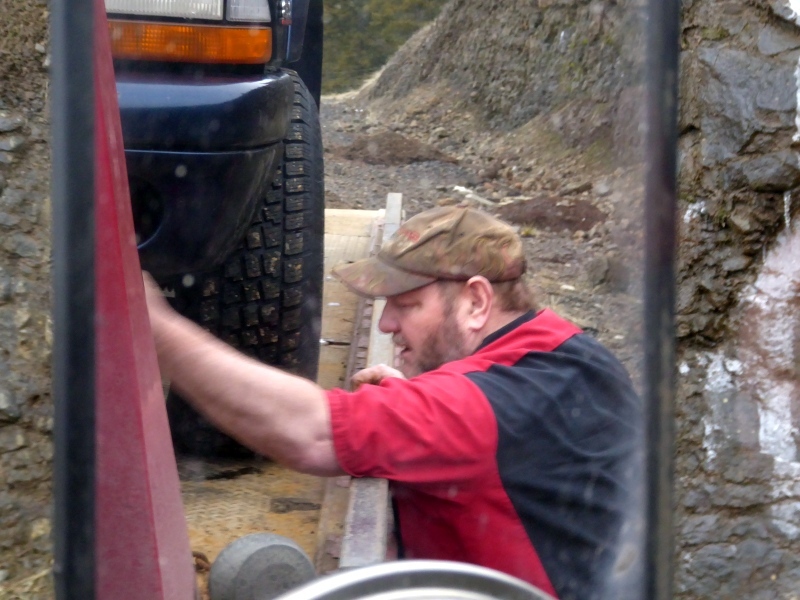 Here Don watches as the vehicle is offloaded. Now it, too, has a date with the Union Gospel Mission in the near future. But meanwhile we were car-less. So this morning we borrowed a neighbor's vehicle and took ourselves into Spokane to go car-shopping. We had perused the car lot's inventory the night before and narrowed the selection down to two possibilities: a 2004 Jeep Liberty (with 130K miles) and a 2005 GMC Yukon (with 175K miles). 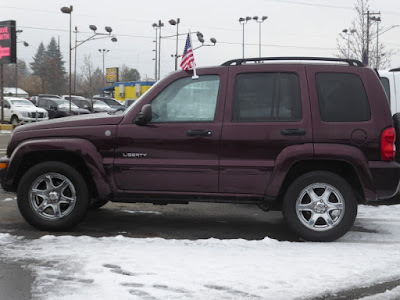 After looking over both vehicles carefully, examining their service records and CarFax histories, and test-driving both, we decided the Yukon was just too big (not to mention $1300 more expensive), so we purchased the Jeep Liberty. While doing the paperwork for the purchase with the salesman, we noticed another salesman whose desk was behind us had an open Bible (Isaiah) on his desk. What a nice sight. It's the kind of place the Union Gospel Mission is. This vehicle was comically described as "Deep molten red," though I'd say it's more of a plum color. Don drove it home while I drove our neighbor's borrowed vehicle, and he is quite pleased with our purchase. So there you go. With a little luck (and maintenance), our tidy plum Jeep will last many years and won't be "biting the dust" anytime soon. We've got a 2003 Jeep Liberty. Good choice. Just got a shop manual for it to keep it going for another 200K. Good luck! Make sure you get the original air bag changed out they can explode. I just got a 2003 Jeep Liberty, too. Unfortunately, I got it from Craigslist and it needs more done to it than I was expecting. Still, it runs! Last January I purchased a 2005 Liberty with 105K miles. I love it! Gas mileage isn't the best, but coming from a Durango you will probably see a small increase in fuel efficiency. I've always bought Japanese and always used. The infrequent breakdowns were better than struggling with monthly payments. 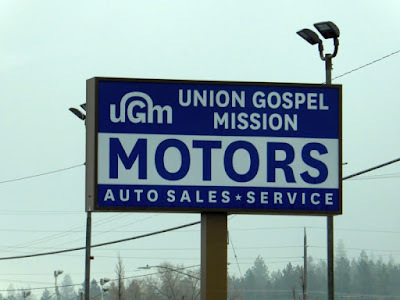 Love UGM Motors! We recently donated a minivan there, and plan to start our car shopping there next time we're in the market. I hope you have good luck with this one. Is older daughters Saturn still going? Hi, Patrice. We have had a Jeep Liberty for about 11 years. For a small vehicle it is well built, heavy, durable and more than meets our need. We bought ours in Anchorage. It was part of our mini caravan, both pulling heavy U-Hauls when we moved to Oklahoma. A new set of tires every few years, a wash job about every 5 years, and since we live on dirt roads, an occasional windshield. This is our third Jeep, the last 2 have been a Liberty. It will also pull a fair size stock trailer. My only gripe with a Jeep is the fuel economy. Tune tweak fiddle and fuss if you must, but the mileage will s*ck. Other than that they are some of the most reliable basic vehicles out there. It should last you a good long time. I bought one at 85K and drove it to 240k with just normal maintenance. It got creamed on the freeway, and was totaled, so I think it had another 50K in it, but I'll never know. I spent a lot on gasoline though. I agree about that MPG. I drive Jeep Cherokee, am on my 2nd one now. I am sure the first would still be running, but unfortunately met up with a tree.